A year ago I was in Boston visiting Cousin Christy. During my stay there we ventured out to an Apple Orchard to pick up some apples and pumpkins. One of the features of this orchard was warm, freshly made Apple Cider Donuts. Of course we bought some! The flavor and warm sweetness were incredible. I have come to understand that these are a fall staple in the North East. This weekend I was supposed to be cooking for an outdoor Water Polo tournament. Unfortunately, thanks to Hurricane Joaquin, it has been cancelled. But before it was cancelled it set me off on the path of trying to make a fall treat. That was when I remembered the Apple Cider Donuts from last year’s trip to Boston. I am not a great baker and I absolutely NEVER fry anything, so this would be a challenge. I found the recipe at Yankee Magazine. I read it carefully and decided to give it a try. What the heck, it’s fried sugared bread, how bad can it be, right? Well this is not for the faint of heart or the time-pressed, but if you take your time and you work it out over several days you will be well rewarded. If I had friends that came to my house for football parties, I would absolutely do this as a treat. 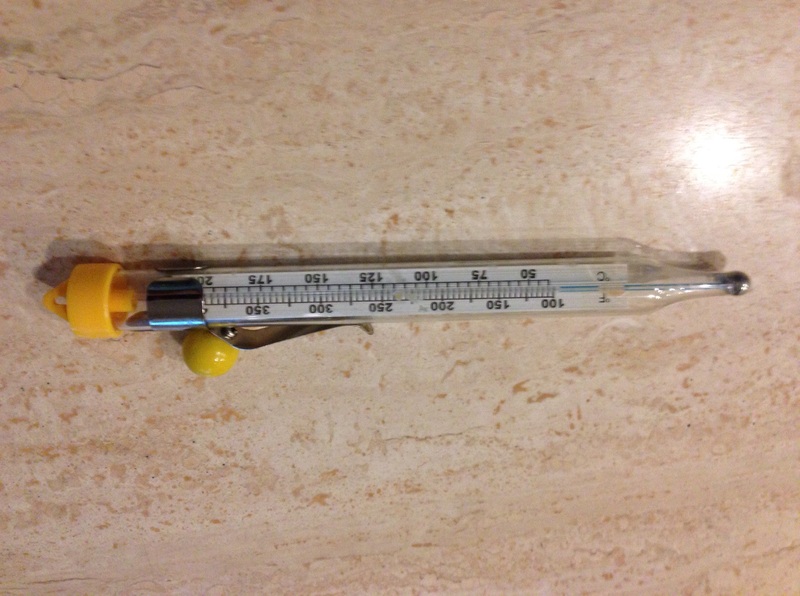 This is a candy thermometer for those of you who are unacquainted. They can be purchased at most grocery stores. I have had mine so long, I am not sure exactly where I got it. If you can’t find it at your local grocery store, try any kitchen store. These are not that expensive and, as Sister Yaya found out when she first got interested in tea, they can be used to measure the temperature of any hot liquid. You will also need willing helpers. Not really, but ever since Rosie made it in to the column, Buzz and Woody have been jealous. So I thought that I would throw them a proverbial bone. 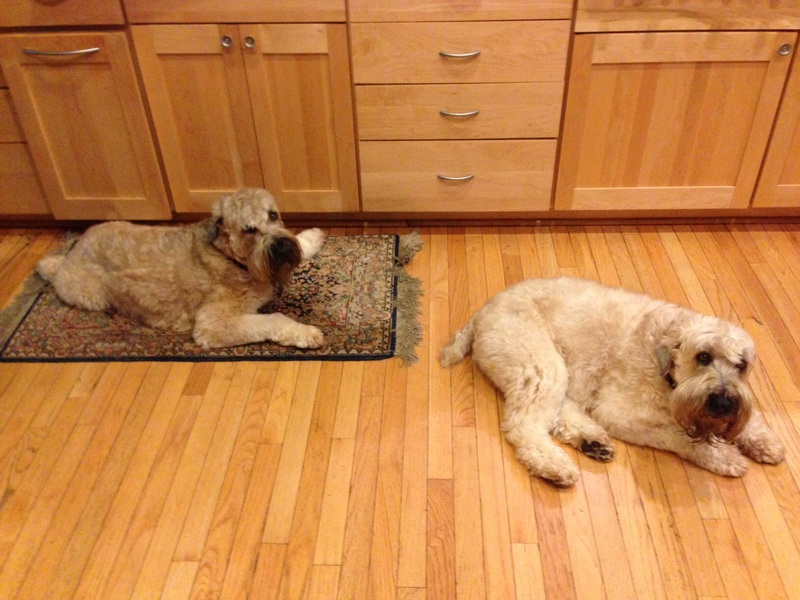 If I am in the kitchen cooking, these two are always there to help out with clean up (of anything that falls on the floor). OK. Let’s pause right here. Note the ingredient “boiled apple cider”. You are going to want to do this a day or 2 ahead. It’s easy; you just take 2 cups of Apple Cider and put it into a small saucepan. You bring it to a simmer and let it cook down until it is a 1/3 cup. It took me about an hour and a half. It will be much thicker, but not quite syrup stage. Cook it down and stick it in the refrigerator until you are ready to use it. 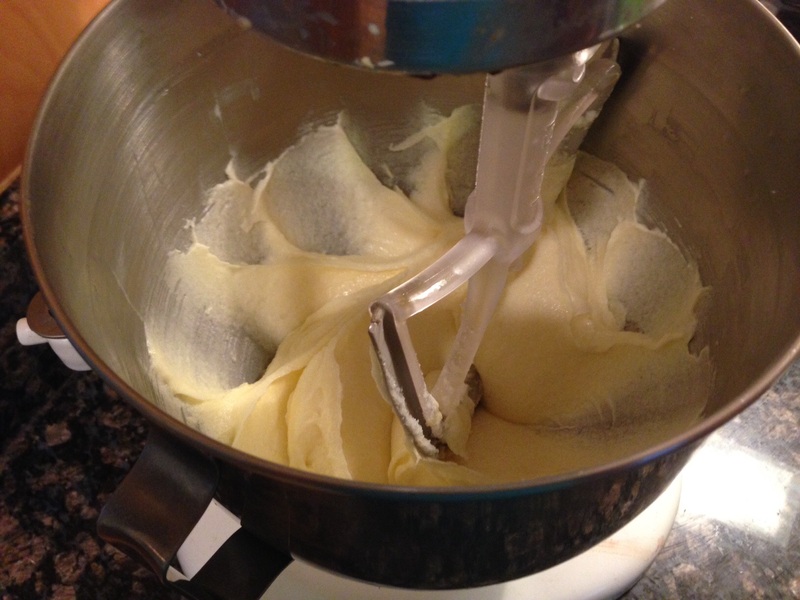 In a large bowl using a hand-held or standing mixer fitted with a whisk attachment, beat together sugar and butter until mixture is pale and fluffy, 4-6 minutes. Add eggs, one at a time, beating a minute after each. 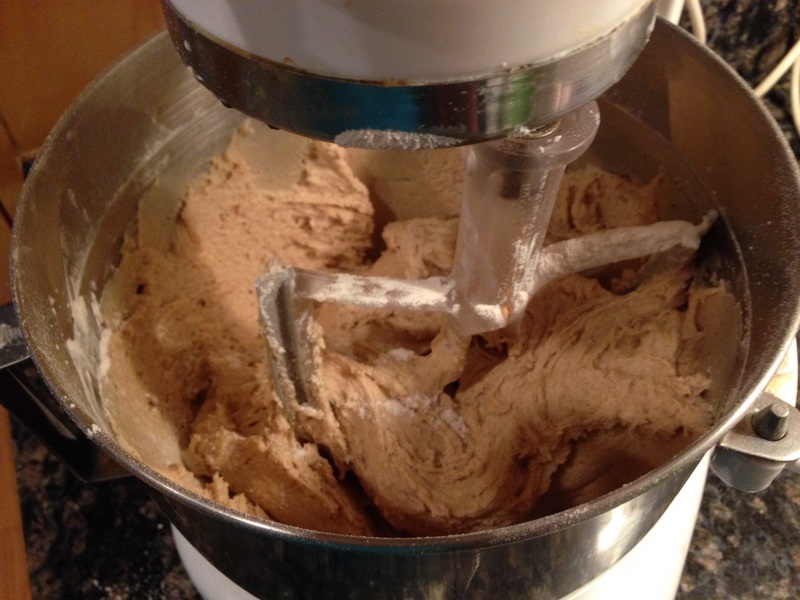 In a medium-size bowl, whisk together flour, salt, baking powder, baking soda, cinnamon, and nutmeg. Set aside. Ok this it where it gets tricky. Don’t eat the batter! It will be hard. The smell is amazing! But once you start it is impossible to stop. 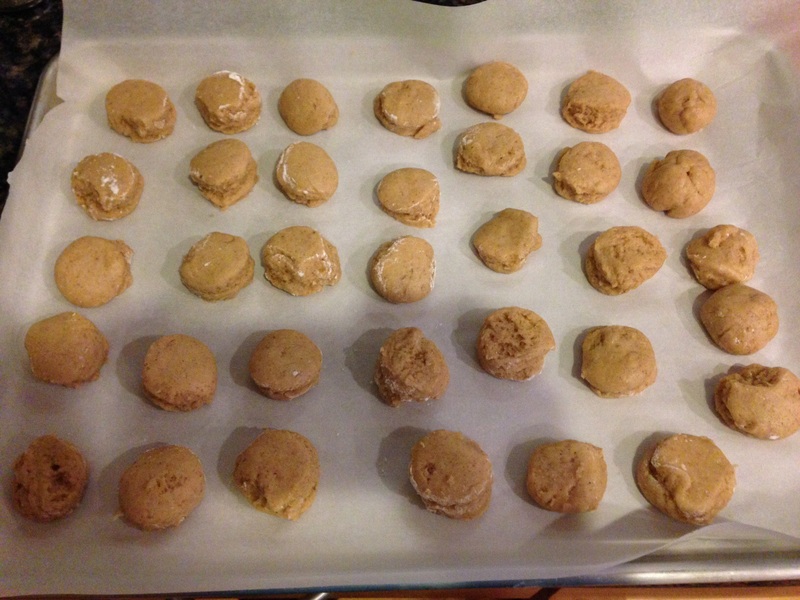 Line two baking sheets with waxed paper or parchment paper and dust generously with flour. Turn dough out onto one baking sheet and pat gently into 3/4-inch-thickness. Sprinkle dough with additional flour, cover with plastic wrap, and place in the freezer for 10 minutes to firm up. Remove dough from the freezer; use a lightly floured 3-inch doughnut cutter (or two concentric biscuit cutters) to cut out about 18 doughnuts with holes. 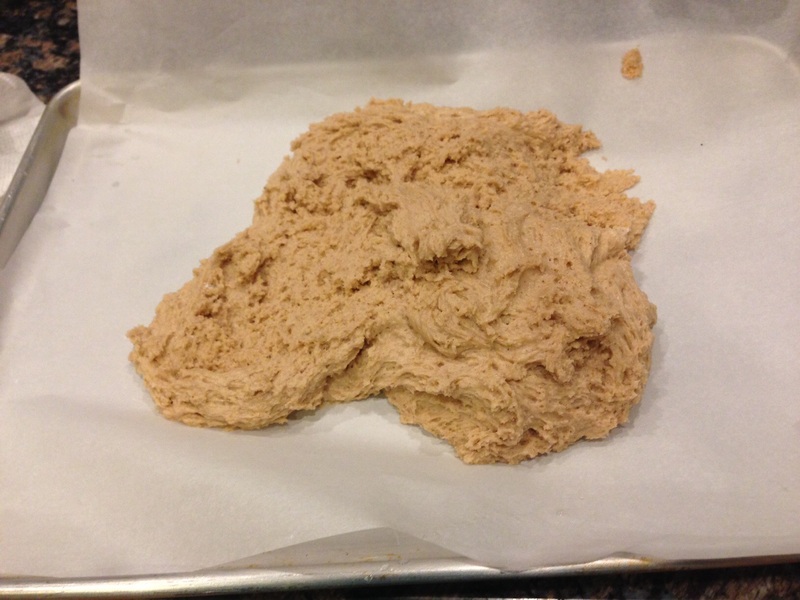 (You may gather the scraps and roll again as needed, but you may need to chill the dough more to firm it up.) Place cut doughnuts on the other baking sheet as you go; then transfer to the freezer for 5 minutes to firm up again. You can’t skip the parchment paper. This is one of the stickiest dough’s that I have worked with. Keeping it chilled will help, but you need lots of flour on you hands and fingers. I personally don’t own a donut cutter. But I did have a shot glass, so I made donut holes. I ended up with 75 donut holes. We are going to be eating these for a while. So I cooked a few and froze the rest of the uncooked dough. If you want to do these for a party, you could make them a day or two ahead, thaw them and cook them during the party. Line a plate with a few layers of paper towels and set it nearby. In a Dutch oven or large pot, heat 3 inches of oil to 370° (test with an instant-read thermometer). 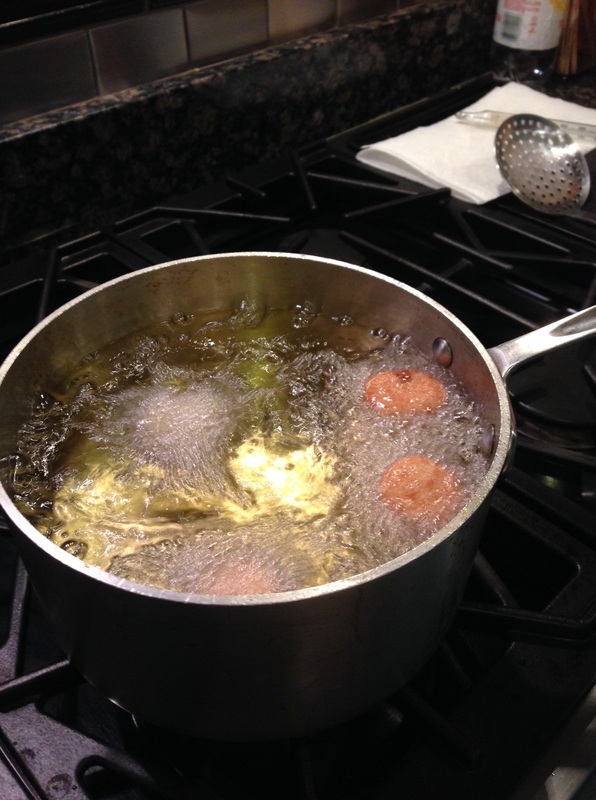 Drop 3 or 4 doughnuts into the oil, being careful not to crowd the pan. Cook until browned on one side, about 1 minute; then flip and cook until browned on the other side, about 1 minute longer. Ok this didn’t work so well for me. I admit it. I burned the outside of the first batch. I had to dial back the temp to 360 in order to get them cooked without burning them. But I can assure you that no donut was lost. Sprinkle? To heck with that idea! Put the sugar and cinnamon in a brown bag and give them a shake. I personally like a mixture confectioner’s sugar and regular sugar. Next time though I want to try making more of the Apple Cider and glazing them with it. It will probably be very sticky. 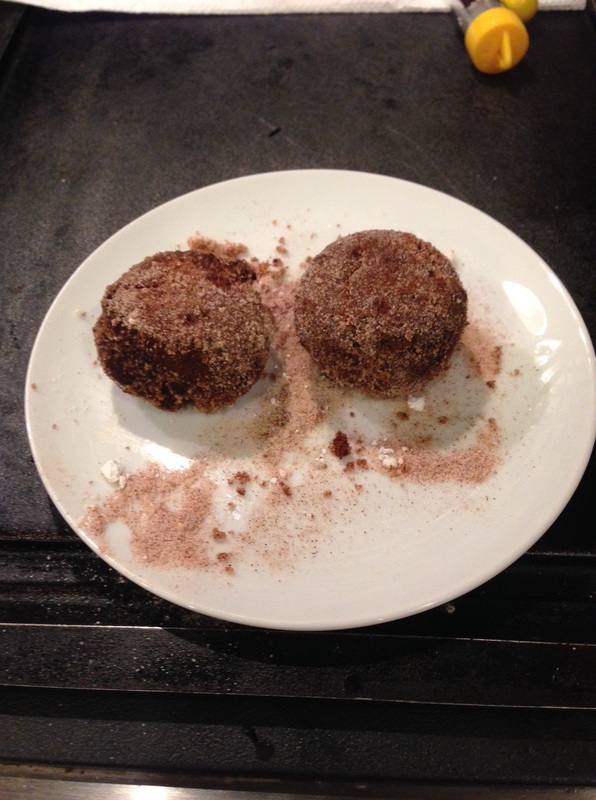 Note: Boiled apple cider gives these apple cider donuts a rich, slightly tangy flavor. You can buy boiled cider at some gourmet and Whole Foods stores; from Wood’s Cider Mill in Springfield, Vermont (woodscidermill.com); or from the King Arthur Flour catalogue. Alternatively, you can boil your own cider by simmering 1&1/2 cups of fresh apple cider down to 1/3 cup in about 25 minutes–it just won’t be as concentrated as the commercial product. Give these a try, but be sure that you have a crowd coming. Or plan to spend every day in the gym for the next month.